In this episode I tell you about my gift for listeners. I then go on to share some vocabulary related to learning and development. You may be used to talking about training and development in your native language but it’s also useful to be able to do this in English – particularly if you want to apply for jobs in English-speaking companies. How do we decide which training we need? Mandatory training – training that all people in a particular team or job role have to have. Training needs assessment – to identify training needs. Personal development record – a document that lists training and development undertaken by a member of staff and their future goals. Some companies have training frameworks that specify what training is available for each job role. Other companies encourage staff to be more proactive in identifying their training needs and how these can be met. Classroom training – training with a trainer where all participants are in the same room. Online training – training that is completed on a computer or mobile device. Customised training – a course which is put together to meet individual needs. Self-paced training or self-study programmes – training that people do on their own, at their own pace. Accredited training – the training itself can take a number of forms but you either receive a certificate for attending or there is an exam at the end that participants need to pass. Distance learning – this is similar to online training in that the recipient doesn’t attend training in person. Induction programme – specific training for new employees. Training with a mentor – a more experienced colleague works with you to help you to develop your skills. On-the-job training – learning by doing. Work-shadowing – spending time with someone who is carrying out a role – either to understand a role that you will be carrying out or to learn how different parts of the organisation work together. Stretch assignment – being given support to undertake a task that would otherwise have been out of an employee’s remit or comfort zone. In-house training – training provided by the company for which you work. Training provided by an external training provider. 360 degree process – performance feedback is gathered about an individual from their peers, managers and people who report to them. This is then used to identify training or development needs. I would like to develop my … skills. I would like to improve my … skills. I have a knowledge gap in terms of … that I would like to redress. Formal certificates or qualifications . You gain knowledge, experience or new abilities. You are permitted to do tasks/apply for roles that would not have been possible before. You may be given additional responsibilities. You will hopefully feel more confident about carrying out certain tasks. You stay up to date in your field. You can add the training to your CV to set yourself apart from other candidates. Developing people, not just skills. We should never stop learning! All of my prices are given in British pounds. £10 is equivalent to about €13.75 at the time of writing this. Why not have a look at my range of products and see whether any would help you? You can then use code birthday161 to receive £10 off a product of your choice. The code can be used once per person and it is valid until 31st December 2015. The code can be used together with other codes from the newsletter and Xing. Training sessions are subject to availability. 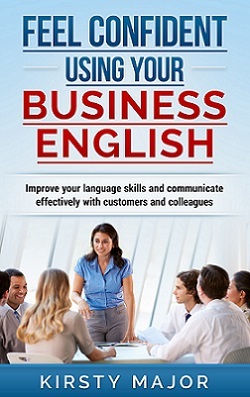 Business English course want a comprehensive course that looks at various aspects of business communication. A 12-module one-to-one course with exercises and practical activities. Grammar modules want to revise areas of grammar or you have questions on one or more topics One-to-one training with 10 one-hour modules to choose from. You can do them all or design your own course. Writing challenge want to develop your writing skills A 5 or 10-week challenge in which you will complete writing tasks independently and receive detailed, written feedback. Audio courses want to learn on your own using my audio content . Courses on developing email-writing and networking skills. Each day you receive around 10 minutes of audio content and a web page with written information. English language and communication training. want to work on your speaking skills and confidence when speaking English. Customised, one-to-one language and communication training.